If you want to be located in a traditional neighborhood in downtown Tallahassee, consider a home in Woodland Drives. This popular subdivision is situated just south of Lafayette Street and is adjacent to Capital City County Club, and it represents a large collection of Tallahassee's historic homes. 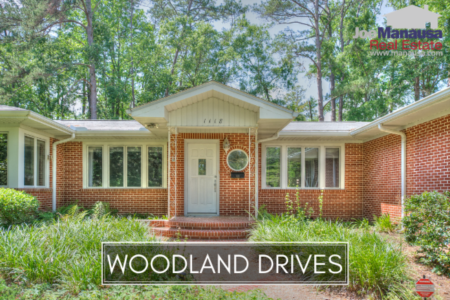 Woodland Drives has homes built primarily from the 1940s through the 1990s, though there are some that date back into the 1800s and some just a year or two old. Unlike many of the "boom neighborhoods" that we have discussed in recent housing reports, a well established neighborhood like Woodland Drives is not likely to be suffering from too much pent-up supply. 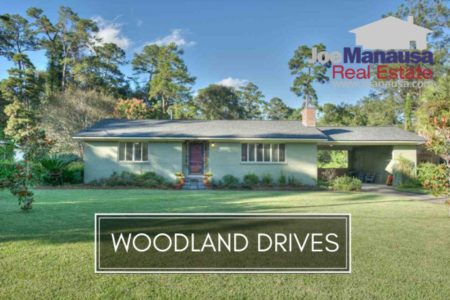 In this report, we will look at prices, values, and sizes of homes in Woodland Drives, as well as show current listings in the Tallahassee MLS and all closed home sales going back to 1991. For each of the three real estate graphs found in this report, you will find the number of closed home sales for each year (red columns, measured on the left vertical axis), and an important real estate statistic shown in blue (measured on the right vertical axis. It is important to note that while the graphs and table will update on a regular basis, the analysis of the information that we provide is current as of this writing in late-March 2015. Average home prices rose 20% in 2014 versus 2013, but have given it all back thus far in 2015. Current prices sit 33% below the peak of the market prices established in 2007. The average recorded sales price is $160,250 for Woodland Drives thus far in 2015, but expect this number to shoot above $200K as some of the "normal" size homes begin to sell (the two sales thus far have been smaller homes). Home sales activity last year was vibrant, with 20 homes sold representing an 8 year high. Thus far in 2015, there have been 2 closed home sales in Woodland Drives, which is significantly slower than the pace set last year. Average home values in Woodland Drives rose 22% in 2014 versus 2013, and have risen another 15% in 2015. This is the third year in a row to see appreciation since the low set back in 2012. Through late March, the average value of a home sold in Woodland Drives has been $122 per square foot. This surge in average values is the result of smaller homes selling and fewer distressed properties selling. All in all, this is still great news for homeowners in the area. The average home size sold in Woodland Drives typically falls in a range of 1,600 to 2,200 square feet, but this year buyers have been selecting very small homes. The 2 sales thus far in 2015 have averaged 1,329 square feet. The following list of homes are the most recent listings in Woodland Drives. The following list shows home sales going back to 1991 in Woodland Drives. I hope you enjoyed our March 2015 update on home sales in Woodland Drives, please feel free to drop me a note if you have questions not covered in this report.